Freeman laughed. ‘You’ll be lucky. It’s been snowing most of the day. Nothing is moving out there. I said you should have left earlier.’ There was a rather smug look on the face of the man leaning against the wall of the austere office. Picking up his briefcase he walked out, pausing for a brief moment to look around the control room. Everything appeared in order, all was as it should be and, satisfied, Ed Straker headed for the outside world. It was a very different world to the one he had left over twelve hours before. The Studio buildings, deserted at this late hour, were dark blocks of shadow, but the landscape was white with deep snow. Fat flakes drifted down in the stillness and the muffled sounds of infrequent vehicles passing by were distorted in the calm air. He stood there for perhaps one minute, looking out at the whiteness, with a rare slight smile on his face, then shaking his head with annoyance, fastened his warm overcoat and set off for his car. It was one of the few benefits to being the studio head, having his Saab parked so close to the main entrance. One of the very few. Other people, other cars, had left their mark on the snow; deep footprints, vehicle tracks, the occasional skid mark and patch of icy grey slush where tyres had not found purchase. All indications that he was not the first to walk in this snow-filled land. Head down in a vain attempt to avoid the flakes catching in his eyes, he strode with cautious care across the treacherous tarmac. Once at the car his movements were brisk. It was too cold to waste time and energy standing out in the snow. Door open. Briefcase on the passenger seat. Brush the soft clinging flakes from his face and shoulders, stamp his already cold feet free of compressed snow. Start the engine. Into second gear to get the car moving on the slippery slush. Then the slow, tenuous drive out onto the access road. Home. He needed to get away from HQ, to relax, to let himself loosen up. To have the chance for once to stop worrying about SHADO and aliens and money and whether he was making the right decisions. It soon became clear, however, that he was not going to get home with any degree of ease. Despite the Saab’s ability to cope with the majority of the atrocious weather conditions that theUKthrew at it on occasions, the roads were heavy with drifting snow and the car’s wiper blades struggled to clear the flakes accumulating on the windscreen. At one point a treacherous patch of ice left by an earlier skidding driver grabbed hold of his car and slewed it across the frozen tarmac. It was as if he was in a white and grey world where snow appeared out of nowhere and came at him horizontally from another dimension. When he was forced to slow down, almost to a standstill with the car creeping along in low gear, he could see that the wind had picked up and drifts were beginning to form against the scrubby hedges and low drystone walls that outlined the edge of the road. Enough. Straker frowned as he accepted the situation. He was not going to get home tonight. Not without assistance. Damn. He allowed the car to glide in a somewhat inelegant slither to stop at the side of the lane, as far off the narrow carriageway as possible. Alec would have a field day. Keeping the engine running, he pulled out his mobile and dialled, sighing with reluctance. ‘Alec, Ed here.’ He could almost hear the smirk on the other end. ‘Stuck? Serves you right. I’ll be out in about half-an-hour with a mobile. They’re about the only things that are moving right now. I’ve got your position. Just stay in the car and keep warm.’ Freeman sounded as smug as Straker had anticipated. The wipers creaked with the effort needed as they pushed the snow away one more time before he gave up and turned them off. Then he was left in silence apart from the soft, almost unheard thrumming of the finely tuned engine. A flick of a switch and his iPod filled the small contained world inside the sanctuary of the Saab with the sound of Bach. It was tempting to turn up the heating, put his head back and sleep. But that would have been foolish. He would have been too vulnerable to anyone approaching the car unseen, unheard. Thick snow was starting to build up on the windows, trapping him inside a whitewashed cell and suddenly his claustrophobia kicked in, his heart began to pound with inexplicable fear, and he had to get out, out of the prison. Snow tumbled down inside the car showering him with delicate flakes as he opened the door and stepped out. The sudden bitter coldness of the night was startling on his face. Taking his breath. Sharp. Biting. But at the same time exhilarating and refreshing. Once outside the white confinement of the vehicle he was able to compose himself and appraise his situation. Scanning the area he realised that he had driven down here every day, along this same road, past these same trees every day for years and yet he had never noticed the gate or the forest track that led between the trees. Too busy with other more important thoughts probably. But he had time now to look at the old trees with their gnarled and twisted and overgrown branches that bent nearly to the floor under the weight of snow. There was not a footprint in sight. Not a sound of any other car. He was alone. Hunching his shoulders inside his thick overcoat, his gloved hands deep in his pockets, his shoes compacted the snow as he stamped his numbing feet in an effort to keep at least some residual warmth in them. A sudden last flurry of snow blew a stinging gust in his face, as if the storm was making its curtain call, the final encore before leaving for another venue. He closed his eyes to avoid the worst, before wiping the tickling and tingling ice-kisses from cheeks and lips and eyes with the back of his glove-clad hand. Then, once again he looked around. There was not a sign of movement in the air, not a sound. The blizzard had gone, leaving its mark behind. A transformed landscape. Black. White. Silent. Sharp contrasts made even sharper by moonlight that eased its way across the snow, glinting diamond bright on unsullied crystals. His breath was a fleeting cloud of warmth that drifted and faded into oblivion. This hushed and tranquil world was almost terrifying in its remoteness and he stepped away from the car and the bleak insecurity of the road and towards the defence of the crumbling wall and gate that formed the barrier to the wood. The five-barred gate was old and weathered, and he had some concern that it might simply fall apart when he moved it, but despite his apprehension he leaned over the top bar and lifted the dead weight to shift it inwards towards the track. A soft creak of old worn wood as he eased it out of the deep rut into which it had settled over the years. It only needed moving a foot or two to allow him to step away from that world of cars and work and responsibilities and promises into somewhere else entirely different. He didn’t look back at his Saab, or the silent road. Just walked with slow, measured steps along the track, careful to avoid turning his ankle on uneven ground. Hands still in pockets, head still down, thinking, remembering. Listening to that unmistakable sound of fresh snow underfoot. The track narrowed, after a couple of hundred yards, to a mere footpath, and the trees seemed to loom closer together, but there was enough space between the old mis-shapen trunks for him to walk on the track, still stooped against the chill, the collar of his sensible coat turned up. Sensible. The word made him feel old. As if there was nothing else for him to be. Sensible. That was what his life was now. Making those rational, those difficult decisions that no one else dared to make. Despite the personal costs to himself. A sensible life full of obligation, duty, accountability. Service. The words were as bitter as gall in his mouth. Where had it all gone? When had his life changed? The pleasure in such a simple thing as walking in fresh untrodden snow. And, with regret for lost chances, he stepped from the path to walk, unseen, under the shelter of the trees, heading back towards his car in the shadows of snow-laden branches, alone and free, not caring that his shoes were ruined, that his trousers were soaked, his feet numb. The SHADO mobile moved with ease over the white satin surface, crushing fragile crystals into grey lumps of sodden ice and slush. The transformation went unnoticed by the occupants of the heavy multi-purpose vehicle. Colonel Freeman was too busy enjoying himself to care about the trail of dirty and chewed ground left behind by the tracks. Ed Straker. Alec grinned to himself. Ed needed rescuing. He cast a surreptitious glance at his co-driver. Nina Barry was concentrating on the road, following theGPSsignal from her commander’s car, her face serious and focussed on the task in hand, unaware of Colonel Freeman’s amusement. He had been expecting the call from Ed, ever since the Commander had decided to drive home. Well, it served him right. About time that Straker listened to advice instead of thinking that he was all-omnipotent and invincible. 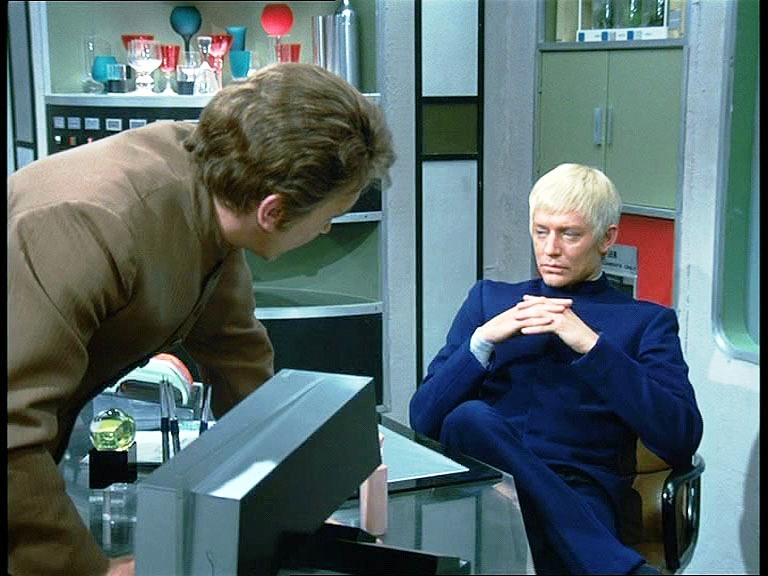 Alec was really looking forward to that moment when Ed Straker looked at him with those blue eyes and that cold and frozen stare, knowing that Alec was just dying to say ‘I told you so.’ Alec wouldn’t even need to say the words. He would just wave at him from the mobile with a look and a smirk. He even had a flask of hot coffee ready. It was bitterly cold out there and for all his smug enjoyment of the situation, there was still a real concern for his friend. Straker watched the moon as she tracked her way across the dark, now cloudless, sky. Skeletal tree limbs, their layers of snow balanced with mathematical and yet precarious precision, overshadowed him and drew dark lines across a face that seemed to be marked with more than tiredness, more than age. A silence deeper than he had known for years surrounded him and, as it filled him, the years fell away. He stood there, a striking bronze statue in dark coat and suit under the silhouettes of ancient branches, and it was as if he was a child again. With a child’s awe and wonder at the world that surrounded him now, as if he had never experienced this before. The pure unsullied snow, hiding every imperfection, every blemish, smoothing out every defect. A perfect, untarnished world. Undisturbed by aliens or enemies. A world that was new and innocent, where he had no need to justify his actions, or face the critical stares and unspoken condemnation that seemed to follow him wherever he went. He shook his head, and gasped as snow slithered from his collar onto his neck bringing him back to cold reality. Alec would be here soon. Alec, no doubt with some quip about Straker not being able to look after himself. He really didn’t want to face that. This calm was all he wanted right now. The chance to be himself, without that overriding need to hide behind the carefully constructed facade that he had built up over the years. To let it all go, at least for a short time on this exquisite night. Then the rumble cut through his reverie. The mobile. Alec had arrived. It was too late then. He had lost his chance. And he leaned back against the tree, eyes closed in quiet desperation. The Saab had been abandoned, its engine cold, windows thick with fallen snow. Freeman opened the door, checked inside. The commander’s mobile tossed on the passenger seat together with his secure briefcase. No sign of anyone in the immediate area. It would be easy to track him though; recent footprints, the only signs of any movement led from Straker’s car up the track through the woods. Alec pulled flashlights from the mobile, fastened his cold weather jacket, and hoped that his friend hadn’t been fleeing from aliens. ‘Let’s go.’ He pushed past the leaning gate now hanging skewed and adrift after being disturbed from its resting place. They walked in the commander’s footsteps, up the forest track, casting their lights to and fro, Alec quiet and uneasy now, all thoughts of snide comments forgotten. The beauty of the pristine landscape went unseen as he strode up the track, his firm confident steps outpacing the earlier tracks made in the snow. He heard the voices, the footsteps, saw the beams of light that contoured the snowdrifts in blue brilliance. And yet it was more than he could do to actually make a move or to call out. He wanted nothing more than to stay here, looking up at the sky and thinking about the past, to stand and watch moonbeams shining on diamond crystals, and, his responsibilities banished for once to the back of his mind, allow himself a rare moment of peace and tranquility. As a child he had always loved the snow, that moment when the first flakes descended from sullen and threatening skies to cover the ground. The wonder of opening the curtains in the morning to see a transformed landscape. The delight of building snowmen in the garden with his family, with no cares, apart from cold hands and feet, and afterwards, the bliss of drinking hot chocolate while numbed fingers slowly tingled back to life. The thrill of jumping with both feet together into deep drifts and the sheer pleasure of falling into snow, tumbling and rolling in it, knowing that, despite the icy fingers that reached inside his clothes to leave freezing trickles of water against his skin, he would be warm again once he was inside with his family. Cherished. Loved. Accepted. But that was in the past. Long past. With that stoic patience he had acquired over the years Straker waited for Alec to draw level so that he could emerge from his sheltered seclusion, smile and nod in agreement and let the Colonel make several gently mocking and sarcastic comments. He would join in their laughter, admit he had been foolish and would let them drive him back to HQ. His hands were cold anyway. The bulk of the tree hid him from view as Alec and Nina walked past, not seeing him standing there, and he felt a pang of loneliness, of isolation, that bleak feeling that he lived with every day. Only now it was heightened, almost unbearably so. The necessary segregation that divided him, as Commander, from their companionship, their camaraderie. In silence he waited, unwilling to move from his refuge. ‘Colonel, if we keep following the tracks we are bound to catch up with the Commander soon. He can’t have gone far in this weather.’ She moved ahead to study the deep footprints that led further up the track. ‘It’s just not like him at all, to wander off like this. Ed Straker doesn’t just leave his car and go off into the woods. Certainly not on a night like this.’ Alec Freeman paused, ‘although there is something rather tempting about being out in snow like this.’ He halted, thinking, daring and then, putting his flashlight down, he acted with a sudden childish impulse. Nina had been concentrating on the track, her mind, with quiet anxiety, fixed on thoughts of the SHADO Commander out here in the dark. It was then that the first missile hit her; squarely between her shoulders. She stumbled forwards and recovered her footing, before turning, startled, to face her assailant. The second missile hit her with equal precision as she spun around. Alec Freeman had armed himself well. Two fat but soft snowballs. Not too compacted, not too fluffy. Handfuls of yielding snow compressed into perfect projectiles and thrown with just the right amount of force. A soft splat as each hit its target, and the accompanying, and very satisfying, gasps from the victim. He bent down to scoop up another double handful of flakes and Nina flung herself sideways. There was no time to do anything other than run for cover. There was plenty of ammunition under the trees, and shelter, and her training took over. Dodging between the thick trunks she looked for somewhere safe to hide, where she could arm herself and maybe fight back. Freeman was taller than she was, taller and stronger. It was no contest really. Now helpless with laughter she headed deeper into the woods, pursued by a flurry of well-aimed and effective missiles. Straker had watched from a distance. Arms folded in an attempt to warm chill-bitten fingers, he stood motionless, unseen, his dark figure hidden in the darker shadows and as Nina Barry came closer, as Alec Freeman, chortling with glee, flung snowballs with unerring accuracy, he acted. The snowball slid out of Alec’s fingers, and he spun around, his mouth open in sudden shocked embarrassment at having been caught in his actions by his superior officer. ‘Perfect. Thank you.’ A dry tone to the voice this time, but tinged with humour as a snowball, thrown with unerring accuracy, hit Freeman in the face. Later on, when he recalled the events of that night, Alec Freeman’s endearing memory was seeing Straker there, moonlight in the pale hair, tossing yet another snowball in those long fingers with the same unmistakable accuracy as he toyed with the sphere on his desk. And the next few minutes were filled with flurries of snow, sparkles of light and echoes of laughter as Nina and Straker allied themselves and reduced him to a splattered casualty. ‘I surrender,’ he pleaded, helpless against their combined efforts. Straker lobbed one last perfect white bauble in a gentle arc that dropped neatly onto Alec’s head and then approached, hands outstretched, still laughing as snow slithered down Freeman’s waterproof parka. ‘Weren’t you meant to be looking for me?’ The speaker, with a totally innocent look and his outwardly calm voice hiding suppressed mirth, stepped out from the shelter of the trees into the path. Moonlight shimmered on Straker’s pale hair as he brushed snow off his coat with nonchalant flicks of his hands. Straker shrugged as if it was nothing more than a minor inconvenience to be standing almost knee-deep in thick snow. ‘I suppose we should go then,’ he said, but he stood there, thoughtful eyes seeing into the far distance as if he was unaware of his surroundings, not moving even when Alec and Nina had set off back for the mobile. ‘Ed? Coming?’ The casual question startled him out of his contemplation and he turned round to shake his head as if coming back to reality. ‘Well. We aren’t in any particular rush are we?’ Alec Freeman had joined them, his eyes bright with the excitement of a conspiracy. There was a pause. ‘Alec?’ Straker queried, his voice carrying a note of almost childish hope. It was quite some time later that the peace of the night was disturbed by the throaty roar of the SHADO mobile as it rumbled into life, its occupants now protected in the sanctuary of the warm and well lit interior. Straker, sitting in the rear seat, had wriggled out of his coat and gratefully pulled off his ruined shoes and socks with a sigh of appreciation, before tugging on the fleece-lined boots and parka that were part of theMobile’s standard winter kit. That felt so good. His fingers were beginning to tingle as well, but it had been worth it. The coffee mug held in his hands warmed him as much as the memory of the evening’s activity. Closing his eyes as the heat relaxed him, he recalled that last moment, as the three of them reached the shaky gate with the sullen grey hulk of the Mobilewaiting on the other side to take him away from this fairy-tale place. Something had made him look up into the branches of the oak tree that seemed to guard the entrance to the wood, and he held his breath with wonder. There, just above him, bright with berries, mistletoe crowded in a thick growth between the trunk and a low branch. On an impulse he turned to Nina and with one caressing hand tilted her face up to his. ‘Happy Christmas Nina,’ he whispered. Her eyes had opened in delight, then as his lips touched hers in such a gentle, feather light contact that she was not sure at first whether she was imagining it, she closed them and kissed him with a fierceness that had taken his breath away. At least Alec had not made any comment. And afterwards, Straker had seen Nina press her fingers to her lips as if to hold in that touch, that taste. He would have done the same, but the moment passed and he was standing in the shadow of theMobile, and somehow it was too late. But, there was always tomorrow. And as sleep drifted over him, he smiled and let his friends drive him home. TheMobilejuddered on its way. Behind it, on the deeply rutted track between the trees, a huge snowman stood and watched in silence as its creators headed for warmth and home and whatever future awaited them. A lot of people think that the poem is about death, but my interpretation is far more innocent, and probably more along the lines of Robert Frost himself. It is the return to the security and freedom of one’s childhood, where there are no responsibilities, no duties, no painful choices to be made. A chance to simply enjoy something as uncomplicated as walking in thick, pure, clean snow. To leave behind the tainted world of pain and service and regrets. For a short time at least. And I like to think that Ed Straker might well have stopped beside those woods and walked there in the snow, thinking about the decisions that he had made that day; possibly decisions that caused someone’s death. Decisions that only he could make, and that condemned him in other people’s eyes. Watch Computer Affair and see how he deals with the fact that he, and he alone, is responsible for the death of the alien. A man like that would not have much chance to let his emotions show. That single moment, head in hands, in his office, before Alec Freeman enters to hand Straker his resignation. That is the Ed Straker who is walking in these woods on this snowy evening. Hoping maybe to find some redemption, some forgiveness, and maybe some friendship. But Straker knows that, as the poet tells him, ‘I have promises to keep, and miles to go before I sleep’. I hope he went home a bit happier afterwards. This entry was posted in UFO Stand Alone and tagged duty, friendship, loneliness, snow by Administrator. Bookmark the permalink.